Sacred site, Mount Taylor, New Mexico. The name says it all. More than just an array of pretty jewelry, Glittering World: Navajo Jewelry of the Yazzie Family, at the National Museum of the American Indian in New York City explores the spirituality and meaning behind the dazzling one-of-a-kind pieces created by Lee and Raymond Yazzie of Gallup, New Mexico. Coral, Water Web Kingman turquoise, opal, lapis lazuli, Orvil Jack turquoise, 14-karat gold, and silver cuff with sun face motif by Raymond C. Yazzie. I have long been fascinated with turquoise stone, predominantly due to my affinity for the Southwest. The landscape there utterly overtakes you, captivates you, and makes you feel simultaneously like you’re nothing and everything. 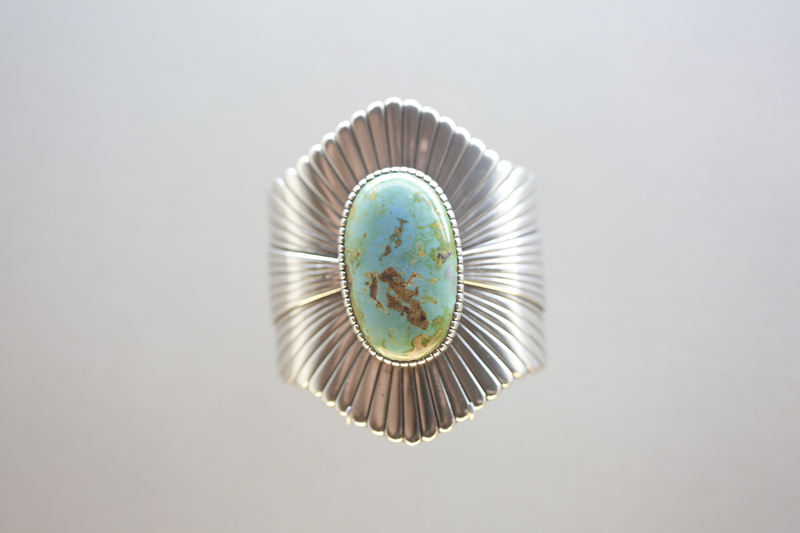 Turquoise, sacred to the Navajo people, plays a major role in their religious ceremonies, but has also traditionally been crafted into jewelry and worn on the body as a representation of wealth and status. Turquoise is a secondary mineral, created as a byproduct of the weathering of other minerals. So many factors must be just right for turquoise to form. Just that fact alone leaves me in awe. Conchos by Lee A. Yazzie. The Yazzie brothers, Raymond and Lee, have succeeded their parents in the family business of jewelry making and have become masters in their own right. Their pieces are almost sculptural in nature and are without a doubt, works of art. 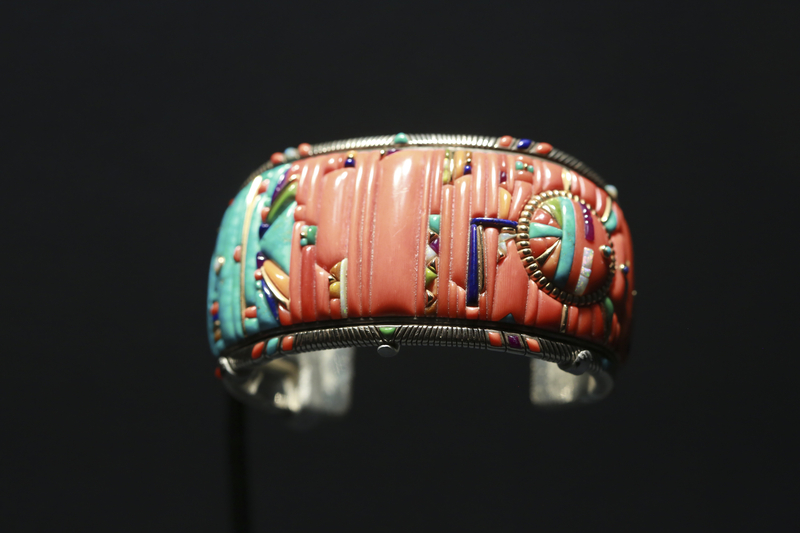 The brothers essentially paint with a dazzling array of natural stones that include, but are not limited to, turquoise, lapis lazuli, coral, and opal, to create their complex motifs that evoke the surrounding landscape of Gallup that they deeply love and respect. Each brother’s process differs slightly– Raymond meticulously renders each piece first while Lee’s is more free form. 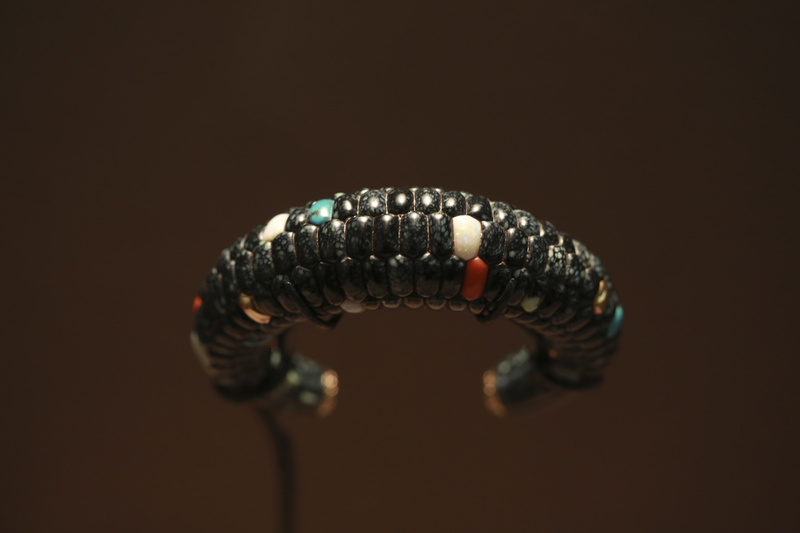 The history of Navajo jewelry making. The exhibition is broken up into five major sections: the history of Navajo jewelry making, the Yazzie family’s tradition of jewelry making, a display of American turquoise from various mines in its roughly hewn form and transformed into jewelry, a video of Lee and Raymond explaining their process, and finally, a magnum opus of the brothers’ work. Glittering World also touches upon Marie Marie, Raymond and Lee’s younger sister’s beautiful jewelry, but not nearly enough. One of my personal favorites was Mary Marie’s reversible “sampler” necklace that featured a myriad of double-sided turquoise and silver beads. Before and after: turquoise from various mines. 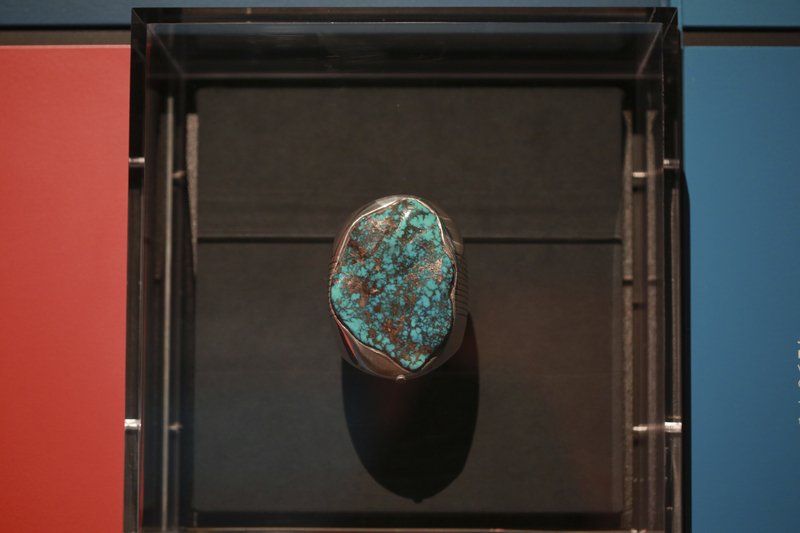 For fans of Navajo jewelry and turquoise or New Yorkers wishing to escape to the big skies of New Mexico, this exhibition is a must see. The museum, housed in the beautiful and historical Alexander Hamilton U.S. Custom House, is worth exploring as well. Admission is free, and the museum is located immediately off of the Bowling Green stop of the 4-5-6 train. 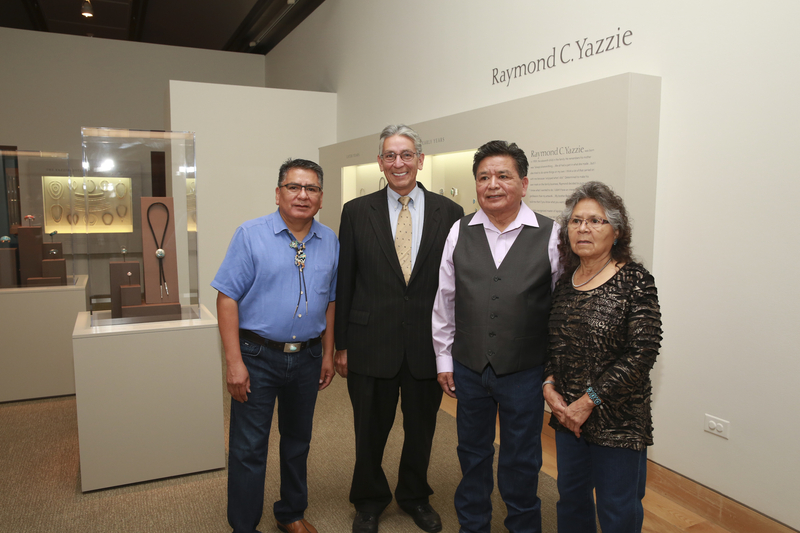 From Left: Lee Yazzie, Kevin Gover (Museum Director), Raymond Yazzie, and Mary Marie Yazzie. Blue Corn Bracelet crafted from Bisbee and Royal Web turquoise, lapis lazuli, opal, and coral by Lee Yazzie in 1980. Blue Gem turquoise and silver cuff by Raymond C. Yazzie. 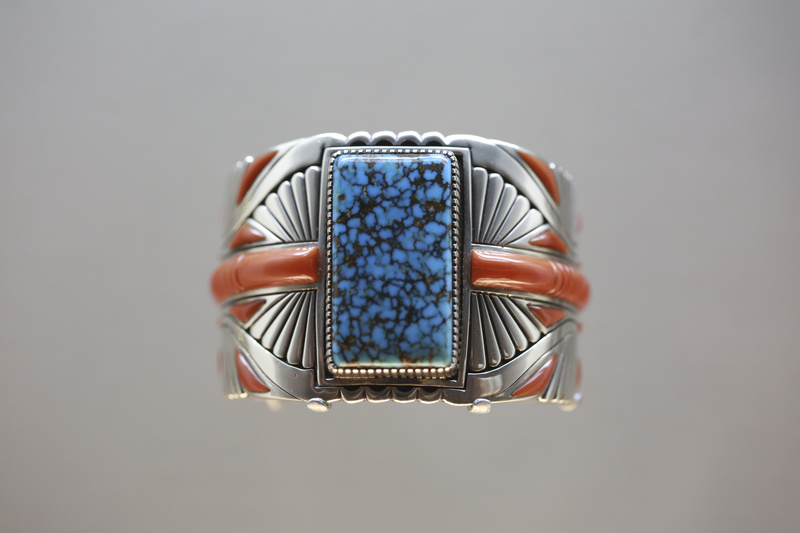 Nevada Blue turquoise, coral, and silver cuff by Lee A. Yazzie from 1975-6. Honestly, I highly doubt it. Yazzie is a very common Navajo surname and this family creates some of the highest quality, not to mention, most beautiful work. However, check this website: http://www.art-amerindien.com/signature_bijoux_amerindiens.htm to see if you can find out who your piece is by!